A couple of years ago, I bought a 4-DVD set at Slapsticon (coming soon in 2007!! ), a major restored-print collection of the work of Roscoe “Fatty” Arbuckle, under the leadership of Paul Gierucki and others whom I meet most years at Slapsticon (coming soon in 2007!!). I can’t say I have no preconceptions. 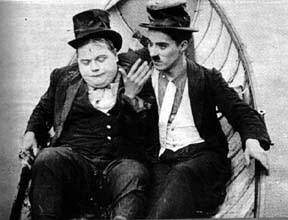 There is no silent-film comic of or near Arbuckle’s importance whose work has turned me on less. This is in part no doubt, I acknowledge, because so much of his work is lost or very difficult to see, in large part as a consequence of the scandal that he’s now better known for. The very first words from Gierucki in the DVD set’s booklet are “The films of Roscoe Arbuckle are in a horrible state of preservation.” Much of what I have seen is his films from the late-10s with Buster Keaton as second banana, but which I watched for Keaton. Early Mack Sennett doesn’t generally float my boat. And “big fat guy jumps around, trying to be funny” didn’t even interest me when Chris Farley was doing it contemporaneously. Still, if you’re a driven obsessive, you’re a driven obsessive. There’s no way a comedian of Arbuckle’s prominence doesn’t deserve my best shot. I’ve enjoyed quite a bit of Arbuckle’s post-scandal work as a pseudonymous director. I think CURSES! one of the greatest shorts of the late silents — look at what tops it in the 1925 list. And at last year’s Slapsticon (have I mentioned that it’s coming soon in 2007!! ), I saw HIS WIFE’S MISTAKE, which was the first Fatty-as-star film that really made me laugh often (the elevator, the barber shop … mmmm … ice cream) and was fully satisfactory as entertainment. I can’t hate these films because they are clearly so primitive that you adjust your critical lenses, like watching 4-year-old children play T-ball versus a major-league game. But I can’t pretend to find them of much entertainment value while watching them, though their historical interest (in several senses) and critical-intellectual worth are beyond dispute. I actually spent most of these two films, thinking mostly about why I resist these and other early Mack Sennett shorts. Several things I noticed, some related to the general state of the art at the time. First of all, they have very few title cards, which makes it hard to develop a situation. FLIRT involves Fatty mistaking a long-bearded raja with a sword and a temper for a woman he can flirt with. Chase ensues (that’s it, more or less). Second, Sennett had a tendency to piece together his physical humor between shots — in other words have a character throw a bucket of water offscreen stage right and then cut to a shot of people being splashed from offscreen stage left. It’s not funny, particularly when so broadly acted. Third, the closeup exists (see the still above from FORCE and there’s an even bigger one in the middle of the film, where Fatty’s face, surrounded by bushes, practically fills the screen) but its use for comic framing, emotional flow or comic timing really doesn’t, this still being the pre-BIRTH OF A NATION era. 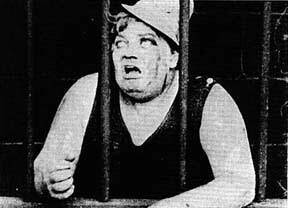 As for Arbuckle, both these shorts surprised me some in that in neither of him does he either play a particularly sympathetic character, nor do they end “happily” for him — in the first he’s in jail, the second ends with him being beaten on by his wife. It gets a bit better here, partly because it’s a two-reel-long film versus the one-reelers above, which gives more time to develop a situation — Fatty defends his girl’s honor from unwanted attention from mashers and does it so brilliantly that he decides to take on the champ at an old-time boxing booth. 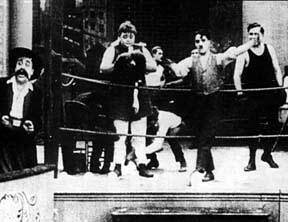 The second half of the film features a famous scene of the boxing match, with four of the silent screen’s biggest stars sharing the screen. There was Charlie Chaplin as the referee, the two fighters played by Fatty and Edgar Kennedy (“King of the Slow Burn” character actor and a real-life ex-boxer), and Mack Swain as a spectator (one of the great silent-comic heavies, particularly in THE GOLD RUSH and other Chaplins). It’s amusing but it’s all chaos because it basically all takes place in the framing that’s above. (There are some cutaways to the audience, with Minta Durfee, the real-life Mrs. Arbuckle, in male drag.) Swain is off to the side, distractingly mugging up a storm, Fatty and Charlie are each trying to steal the show (Charlie mostly wins that one, seemingly doing three things at one time) while Edgar and Fatty are trying to choreograph a believable comic fight. There is one moment I will never forget because it was so unexpected in the midst of the usual Sennettic frenetics in stage-proscenium framing. Fatty is gonna take off his pants to change into boxing trunks. His eye catches the camera, he smiles at it, gestures with his hands, then the camera tilts up until Fatty is cut off at the shoulder. Change gear. Tilt back down. We see breaking the fourth-wall and an onscreen character “direct” the frame to do something then-unusual. This is in 1914. Before Griffith had finished BIRTH OF A NATION, the movies had pomo foregrounding of the text — self-referentiality when the medium hardly had a self to refer to. Now we’re cooking. First film on the disc I’d unhesitatingly recommend to anyone, it’s a very simple premise that indicate that Fatty and Charlie could have made a great Laurel & Hardy team (not that they didn’t do rather well anyway). The two are clearly well off, in top hats and tails; this is just before Charlie becomes “the Little Tramp” and his character has a rougher, meaner edge — striking matches on bald man’s head, say. The two men go home drunk, to opposite sides of a hotel hallway. Charlie is dominated by his battleax wife (incredibly funny as he tries to maintain his dignity while having the crap kicked out of him). Fatty is more indulgent toward his petite flower, but each couple hears the other quarreling, and the pratfalls begin. But the thing present here that’s absent from most Keystones is a few touches (only a few, but they go a long way) of character chemistry, strong image framing and believable reactions to all the hijinks. There’s a quick moment where Fatty and Charlie, having stolen some money from the ladies (a subtler gag than usual) go off to drink, walk around each other, lock arms and gallivant off. Chaplin’s grace and Fatty’s athleticism play off against each other well. And the basic situation is believable — the two want one thing, to get drunk and pass out, and spend the movie pursuing it. There is a great scene where the two go to a swanky restaurant and decide that those tablecloths look … yawn … inviting. ROUNDERS also is that Sennett rarity that doesn’t end in a chase (not really, not when you think about it). Instead it ends on a boat, as shown above in the first image of Arbuckle I ever saw as a little boy,² with another of those surprising and rather ambiguous endings. In this short, Fatty plays an early version of his Country Boy Bumpkin character whose girl Lizzie gets fascinated by the city slicker who drives through the village. She runs off with a young Charley Chase, gets appalled by the vice there (dancing and drinking, y’know) and Fatty goes to the city to take her back and gets in a bar brawl. Contrary to the commentary track, someone picking up a piano and throwing it into a wall or picking up a car by the bumper is not funny per se. But one of the magical things about silent films, and which rewards immersion in them, is that even when they’re aesthetically trivial, they can often retain interest as historical documents: in this case, of the values of the time. First of all, you see America on the eve of Prohibition and the appalled reaction of Lizzie to the saloon, unremarked upon and taken as normal, tells you the psychology of how this social-policy mistake could have happened. There’s a similar “moment of non-recognition” in THE KNOCKOUT where, as I noted above, “Fatty’s girl” has to don male clothes to attend a fight, as if she were an Iranian soccer fan. Second, Fatty and Lizzie are engaged at the start, but you can piece together that they are living in the same home, though with the girl’s parents. LEADING LIZZIE ASTRAY doesn’t construct this “shack up” arrangement as leading Lizzie astray, in fact considers it completely unremarkable. Was this in fact a common arrangement at the time, I’m curious to know, from anybody with the requisite knowledge who may read this? Also, in the Things You Knew About Film History That Aren’t True Department: Arbuckle the director cross-cuts between two simultaneous events to generate a kind of suspense, and to raise the moral stakes of the film — Fatty finding and reading the “I have run away to the city” note and assuring the in-laws-to-be that he’ll rescue her, while Lizzie and her new beau explore the fleshpots. He does this, again, before Griffith made BIRTH OF A NATION, usually credited with introducing this technique. ¹ I consider the late-silent period, once the new medium had been fully developed, (1924-28 with some bleedover) to be maybe the greatest “wave” in film history. ² It was in a “true crime” magazine, an odd passion I had at age 9, to illustrate an article about the Arbuckle scandal and trial.